Returning home during the first signs of spring takes on special meaning with my family. My mother is generally waiting for the arrival of new lambs and my father's list of post-winter repair tasks is long. Despite the toll that winter storms take in upstate New York, there is always a renewed optimism about personal projects and the land. 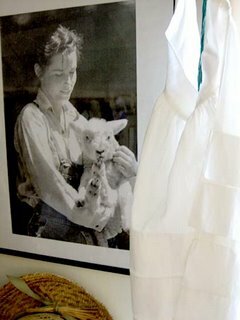 My mother, Abigail, is a handspinner and fiber artist who spent most of her summers as a young girl tending to sheep on a small island off the coast of central Maine. She was the daughter of an eccentric zoologist and a bookish botanist, yet her involvement with nature and the seasons was always intuitive and 'homespun practical' on some level. Her patience for putting together the ideal flock was further developed during her time as a dedicated dairy farmer and entrepreneurial sheepherder with my father, James. Today she has a hand-picked flock of fourteen Leicester Cross sheep and a miniature donkey who proudly serves as the resident shepherd and off-tune watch dog. 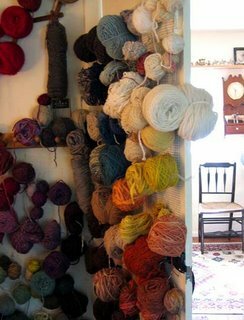 There is something uniquely special about sneaking into your artist mother's studio –especially when she is nowhere in sight. It is not only being privy to someone else's creative process but perhaps also an insight into the source of your own aesthetic leanings and tendencies. This is not to say that a direct stylistic correlation exists. However, one cannot deny that 'the warp and weft' of one's personal philosophy begins with this material. The miniature still lives that abound are evidence perhaps that there is still life in what you remember to be lasting and real in a world that often seems to be fleeting and unraveling at the core. 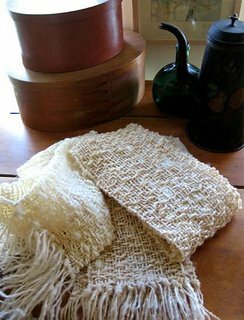 Abigail McEnroe's luxuriously handspun wool products and Nuno felted fibers can be found at MeriMac Farm in Garrattsville, NY, not far from the Cooperstown Leatherstocking region. Abigail's studio e-mail is aghaglady@twcny.rr.com.